Chart No. 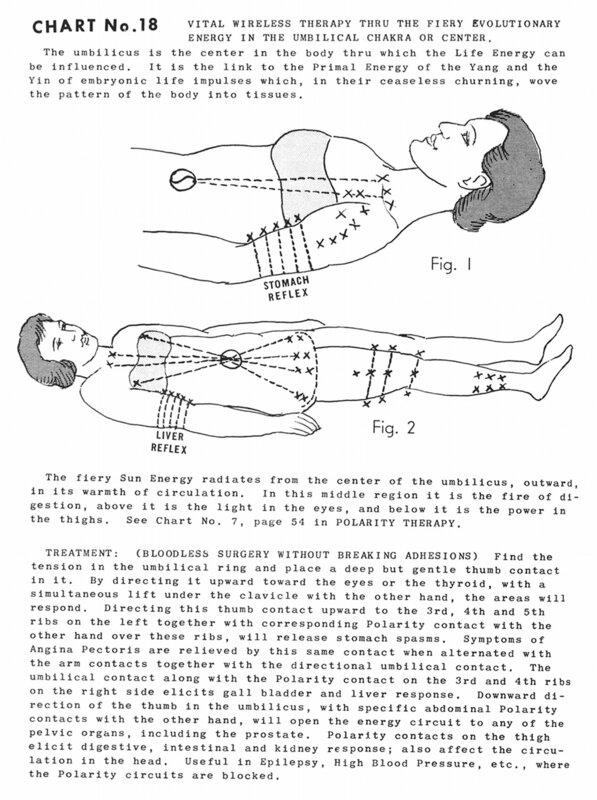 18 - Vital Wireless Therapy Thru [Through] the Fiery Evolutionary Energy in the Umbilical Chakra or Center. The umbilicus is the center in the body thru [through] which the life energy can be influenced. It is the link to the primal energy of the yang and the yin of embryonic life impulses which, in their ceaseless churning, wove the pattern of the body into tissues. The fiery sun energy radiates from the center of the umbilicus, outward, in its warmth of circulation. In this middle region it is the fire of digestion, above it is the light in the eyes, and below it is the power in the thighs. See Chart No. 7, page 54 in Polarity Therapy. Treatment: (Bloodless surgery without breaking adhesions) Find the tension in the umbilical ring and place a deep but gentle thumb contact in it. By directing it upward toward the eyes or the thyroid, with a simultaneous lift under the clavicle with the other hand, the areas will respond. 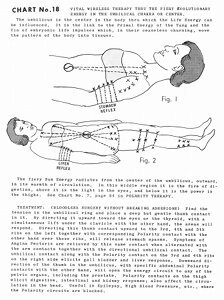 Directing this thumb contact upward to the 3rd [third], 4th [fourth] and 5th [fifth] ribs on the left together with corresponding polarity contact with the other hand over these ribs, will release stomach spasms. Symptoms of angina pectoris are relieved by this same contact when alternated with the arm contacts together with the directional umbilical contact. The umbilical contact along with the polarity contact on the 3rd [third] and 4th [fourth] ribs on the right side elicits gall bladder and liver response. Downward direction of the thumb in the umbilicus, with specific abdominal polarity contacts with the other hand, will open the energy circuit to any of the pelvic organs, including the prostate. Polarity contacts on the thigh elicit digestive, intestinal and kidney response; also affect the circulation in the head. Useful in epilepsy, high blood pressure, etc., where the polarity circuits are blocked.